The court finds that the notice to the Settlement Class of the pendency of the Class Action and of this settlement, as provided by the Settlement Agreement and by the Preliminary Approval Order dated December 7, 2017, constituted the best notice practicable under the circumstances to all persons and entities within the definition of the Settlement Class, and fully complied with the requirements of Federal Rules of Civil Procedure Rule 23 and due process. Due and sufficient proof of the execution of the Notice Plan as outlined in the Preliminary Approval Order has been filed. The form, content, and method of dissemination of Notice of Settlement given to the Settlement Class was adequate and reasonable and constituted the best notice practicable under the circumstances, including both individual notice to all Settlement Class Members who could be identified through reasonable effort and publication notice. Notice of Settlement, as given, complied with the requirements of Rule 23 of the Federal Rules of Civil Procedure, satisfied the requirements of due process, and constituted due and sufficient notice of the matters set forth herein. Notice of the Settlement was provided to the appropriate regulators pursuant to the Class Action Fairness Act, 28 U.S.C. § 1715(c)(1). Bias v. Wells Fargo & Company, et al. The Court determines that the Notice Plan as implemented was reasonably calculated to provide the best notice practicable under the circumstances and contained all required information for members of the proposed Settlement Class to act to protect their interests. The Court also finds that Class Members were provided an adequate period of time to receive Notice and respond accordingly. Gary, LLC v. Deffenbaugh Industries, Inc., et al. The Court hereby finds and concludes that members of the Settlement Class have been provided the best notice practicable of the Settlement and that such notice satisfies all requirements of due process, Rule 23 of the Federal Rules of Civil Procedure, the Class Action Fairness Act of 2005, 28 U.S.C. § 1715, and all other applicable laws. The Court finds that the Settlement Notice provided to potential members of the Class constituted the best and most practicable notice under the circumstances, thereby complying fully with due process and Rule 23 of the Arkansas Rules of Civil Procedure. Miner v. Philip Morris USA, Inc. This Court finds that the Notice Program and the Notice provided to Settlement Class members fully satisfied the requirements of constitutional due process, the N.Y. C.P.L.R., and any other applicable laws, and constituted the best notice practicable under the circumstances and constituted due and sufficient notice to all persons entitled thereto. The Court hereby finds that the Notice provided to the Settlement Class constituted the best notice practicable under the circumstances. Said Notice provided due and adequate notice of these proceedings and the matters set forth herein, including the terms of the Settlement Agreement, to all persons entitled to such notice, and said notice fully satisfied the requirements of Fed. R. Civ. P. 23, requirements of due process and any other applicable law. Notice of the Asbestos Bar Date as set forth in this Asbestos Bar Date Order and in the manner set forth herein constitutes adequate and sufficient notice of the Asbestos Bar Date and satisfies the requirements of the Bankruptcy Code, the Bankruptcy Rules, and the Local Rules. In re: Energy Future Holdings Corp, et al. The court finds that the Notice Plan, as described in the Settlement and related declarations, has been faithfully carried out and constituted the best practicable notice to Class Members under the circumstances of this Action, and was reasonable and constituted due, adequate, and sufficient notice to all Persons entitled to be provided with Notice. The court also finds that the Notice Plan was reasonably calculated, under the circumstances, to apprise Class Members of: (1) the pendency of this class action; (2) their right to exclude themselves from the Settlement Class and the proposed Settlement; (3) their right to object to any aspect of the proposed Settlement (including final certification of the Settlement Class, the fairness, reasonableness, or adequacy of the proposed Settlement, the adequacy of the Settlement Class’s representation by Named Plaintiffs or Class Counsel, or the award of attorney’s and representative fees); (4) their right to appear at the fairness hearing (either on their own or through counsel hired at their own expense); and (5) the binding and preclusive effect of the orders and Final Order and Judgment in this Action, whether favorable or unfavorable, on all Persons who do not request exclusion from the Settlement Class. As such, the court finds that the Notice fully satisfied the requirements of the Federal Rules of Civil Procedure, including Federal Rule of Civil Procedure 23(c)(2) and (e), the United States Constitution (including the Due Process Clause), the rules of this court, and any other applicable law, and provided sufficient notice to bind all Class Members, regardless of whether a particular Class Member received actual notice. 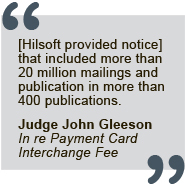 Pursuant to the Court’s Preliminary Approval Order, the Settlement Administrator, Epiq Systems, Inc. [Hilsoft Notifications], has complied with the approved notice process as confirmed in its Declaration filed with the Court on March 23, 2016. The Court finds that the notice process was designed to advise Class Members of their rights. The form and method for notifying Class Members of the settlement and its terms and conditions was in conformity with this Court’s Preliminary Approval Order, constituted the best notice practicable under the circumstances, and satisfied the requirements of Federal Rule of Civil Procedure 23(c)(2)(B), the Class Action Fairness Act of 2005 (“CAFA”), 28 U.S.C. § 1715, and due process under the United States Constitution and other applicable laws. Chimeno-Buzzi v. Hollister Co. and Abercrombie & Fitch Co.
Notice to the Settlement Class and other potentially interested parties has been provided in accordance with the notice requirements specified by the Court in the Preliminary Approval Order. Such notice fully and accurately informed the Settlement Class members of all material elements of the proposed Settlement and of their opportunity to object or comment thereon or to exclude themselves from the Settlement; provided Settlement Class Members adequate instructions and a variety of means to obtain additional information; was the best notice practicable under the circumstances; was valid, due, and sufficient notice to all Settlement Class members; and complied fully with the laws of the State of Illinois, Federal Rules of Civil Procedure, the United States Constitution, due process, and other applicable law. Adkins v. Nestle Purina PetCare Company, et al. The Court finds that the Settlement Class Members were provided with the best practicable notice; the notice was reasonably calculated, under [the] circumstances, to apprise interested parties of the pendency of the action and afford them an opportunity to present their objections.'' Shutts, 472 U.S. at 812 (quoting Mullane, 339 U.S. at 314-15). This Settlement with Capital One was widely publicized, and any Settlement Class Member who wished to express comments or objections had ample opportunity and means to do so. Azari Decl. ¶¶ 30-39. Steen v. Capital One, N.A. This Court finds that the Class Notice was provided to the Settlement Class consistent with the Preliminary Approval Order and that it was the best notice practicable and fully satisfied the requirements of the Federal Rules of Civil Procedure, due process, and applicable law. The Court finds that the Notice Plan that was implemented by the Claims Administrator satisfies the requirements of FED. R. CIV. P. 23, 28 U.S.C. § 1715, and Due Process, and is the best notice practicable under the circumstances. The Notice Plan constituted due and sufficient notice of the Settlement, the Final Approval Hearing, and the other matters referred to in the notices. Proof of the giving of such notices has been filed with the Court via the Azari Declaration and its exhibits. The Court finds that the notice was reasonably calculated under the circumstances to apprise the Settlement Class of the pendency of this action, all material elements of the Settlement, the opportunity for Settlement Class Members to exclude themselves from, object to, or comment on the settlement and to appear at the final approval hearing. The notice was the best notice practicable under the circumstances, satisfying the requirements of Rule 23(c)(2)(B); provided notice in a reasonable manner to all class members, satisfying Rule 23(e)(1)(B); was adequate and sufficient notice to all Class Members; and, complied fully with the laws of the United States and of the Federal Rules of Civil Procedure, due process and any other applicable rules of court. Rose v. Bank of America Corporation, and FIA Card Services, N.A. Notice to the Settlement Class has been provided in accordance with the Preliminary Approval Order. Based on the Declaration of Cameron Azari dated March 7, 2014, such Class Notice has been provided in an adequate and sufficient manner, constitutes the best notice practicable under the circumstances and satisfies the requirements of California Civil Code Section 1781, California Civil Code of Civil Procedure Section 382, Rules 3.766 of the California Rules of Court, and due process. Wong et al. v. Alacer Corp. The Class Administrator notified class members of the terms of the proposed settlement through a mailed notice and publication campaign that included more than 20 million mailings and publication in more than 400 publications. The notice here meets the requirements of due process and notice standards… The objectors’ complaints provide no reason to conclude that the purposes and requirements of a notice to a class were not met here. The Court finds that the dissemination of the Class Notice… as described in Notice Agent Lauran Schultz’s Declaration: (a) constituted the best practicable notice to Class Members under the circumstances; (b) constituted notice that was reasonably calculated, under the circumstances…; (c) constituted notice that was reasonable, due, adequate, and sufficient; and (d) constituted notice that fully satisfied all applicable legal requirements, including Rules 23(c)(2)(B) and (e)(1) of the Federal Rules of Civil Procedure, the United States Constitution (including Due Process Clause), the Rules of this Court, and any other applicable law, as well as complied with the Federal Judicial Center’s illustrative class action notices. Approximately 3.9 million notices were delivered by email to class members, but only a very small percentage objected or opted out . . . The Court . . . concludes that notice of settlement to the class was adequate and satisfied all requirements of Federal Rule of Civil Procedure 23(e) and due process. Class members received direct notice by email, and additional notice was given by publication in numerous widely circulated publications as well as in numerous targeted publications. These were the best practicable means of informing class members of their rights and of the settlement’s terms. The notice plan's multi-faceted approach to providing notice to settlement class members whose identity is not known to the settling parties constitutes "the best notice [*26] that is practicable under the circumstances consistent with Rule 23(c)(2)(B). Moreover, plaintiffs have submitted [a] declaration from Cameron Azari (docket #129), a nationally recognized notice expert, who attests that fashioning an effective joint notice is not unworkable or unduly confusing. Azari also provides a detailed analysis of how he would approach fashioning an effective notice in this case. Gessele et al. v. Jack in the Box, Inc. The parties retained Hilsoft Notifications ("Hilsoft"), an experienced class-notice consultant, to design and carry out the notice plan. The form and content of the notices provided to the class were direct, understandable, and consistent with the "plain language" principles advanced by the Federal Judicial Center. The Court received no objections to the scope or content of the [Medical Benefits] Notice Program. (Azari Supp. Decl. ¶ 12.) The Court finds that the Notice and Notice Plan as implemented satisfied the best notice practicable standard of Rule 23(c) and, in accordance with Rule 23(e)(1), provided notice in a reasonable manner to Class Members who would be bound by the Settlement, including individual notice to all Class Members who could be identified through reasonable effort. Likewise, the Notice and Notice Plan satisfied the requirements of Due Process. The Court also finds the Notice and Notice Plan satisfied the requirements of CAFA. The Court finds that the Class Notice and Class Notice Plan satisfied and continue to satisfy the applicable requirements of Federal Rule of Civil Procedure 23(c)(2)(b) and 23(e), the Class Action Fairness Act (28 U.S.C. § 1711 et seq. ), and the Due Process Clause of the United States Constitution (U.S. Const., amend. V), constituting the best notice that is practicable under the circumstances of this litigation. 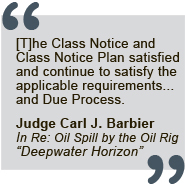 The notice program surpassed the requirements of Due Process, Rule 23, and CAFA. Based on the factual elements of the Notice Program as detailed below, the Notice Program surpassed all of the requirements of Due Process, Rule 23, and CAFA. The media notice effort alone reached an estimated 95% of adults in the Gulf region an average of 10.3 times each, and an estimated 83% of all adults in the United States an average of 4 times each. These figures do not include notice efforts that cannot be measured, such as advertisements in trade publications and sponsored search engine listings. The Notice Program fairly and adequately covered and notified the class without excluding any demographic group or geographic area, and it exceeded the reach percentage achieved in most other court-approved notice programs. See Azari Decl. ¶¶ 10-11, 13, 69-70, 77; Azari Supp. Decl. ¶ 6. Notice given to Class Members and all other interested parties pursuant to this Court’s order of April 18, 2012, was reasonably calculated to apprise interested parties of the pendency of the action, the certification of the Class as Defined for settlement purposes only, the terms of the Settlement Agreement, Class Members rights to be represented by private counsel, at their own costs, and Class Members rights to appear in Court to have their objections heard, and to afford persons or entities within the Class Definition an opportunity to exclude themselves from the Class. Such notice complied with all requirements of the federal and state constitutions, including the Due Process Clause, and applicable articles of the Louisiana Code of Civil Procedure, and constituted the best notice practicable under the circumstances and constituted due and sufficient notice to all potential members of the Class as Defined. Opelousas General Hospital Authority, A Public Trust, D/B/A Opelousas General Health System and Arklamiss Surgery Center, L.L.C. v. FairPay Solutions, Inc. The Court finds that the Notice previously approved was fully and properly effectuated and was sufficient to satisfy the requirements of due process because it described “the substantive claims . . . [and] contained information reasonably necessary to [allow Settlement Class Members to] make a decision to remain a class member and be bound by the final judgment.'' In re Nissan Motor Corp. Antitrust Litig., 552 F.2d 1088, 1104-05 (5th Cir. 1977). The Notice, among other things, defined the Settlement Class, described the release as well as the amount and method and manner of proposed distribution of the Settlement proceeds, and informed Settlement Class Members of their rights to opt-out or object, the procedures for doing so, and the time and place of the Final Approval Hearing. The Notice also informed Settlement Class Members that a class judgment would bind them unless they opted out, and told them where they could obtain more information, such as access to a full copy of the Agreement. Further, the Notice described in summary form the fact that Class Counsel would be seeking attorneys' fees of up to 30 percent of the Settlement. Settlement Class Members were provided with the best practicable notice “reasonably calculated, under [the] circumstances, to apprise them of the pendency of the action and afford them an opportunity to present their objections.'' Mullane, 339 U.S. at 314. The content of the Notice fully complied with the requirements of Rule 23. The Court finds that the Notice and the Notice Plan was fulfilled, in accordance with the terms of the Settlement Agreement, the Amendment, and this Court’s Preliminary Approval Order and that this Notice and Notice Plan constituted the best practicable notice to Class Members under the circumstances of this action, constituted due and sufficient Notice of the proposed Settlement to all persons entitled to participate in the proposed Settlement, and was in full compliance with Ga. Code Ann § 9-11-23 and the constitutional requirements of due process. Extensive notice was provided to the class, including point of sale notification, publication notice and notice by first-class mail for certain potential Class Members. The affidavit of the notice expert conclusively supports this Court’s finding that the notice program was adequate, appropriate, and comported with Georgia Code Ann. § 9-11-23(b)(2), the Due Process Clause of the Constitution, and the guidance for effective notice articulate in the FJC’s Manual for Complex Litigation, 4th. 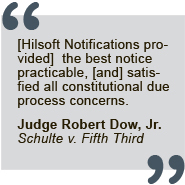 The notice that has been given clearly complies with Rule 23(e)(1)’s reasonableness requirement… Hilsoft Notifications analyzed the notice plan after its implementation and conservatively estimated that notice reached 81.4 percent of the class members. (Docket Entry No. 106, ¶ 32). Both the summary notice and the detailed notice provided the information reasonably necessary for the presumptive class members to determine whether to object to the proposed settlement. See Katrina Canal Breaches, 628 F.3d at 197. Both the summary notice and the detailed notice “were written in easy-to-understand plain English.” In re Black Farmers Discrimination Litig., — F. Supp. 2d —, 2011 WL 5117058, at *23 (D.D.C. 2011); accord AGGREGATE LITIGATION § 3.04(c).15 The notice provided “satisf[ies] the broad reasonableness standards imposed by due process” and Rule 23. Katrina Canal Breaches, 628 F.3d at 197 (internal quotation marks omitted). The form, content, and method of dissemination of Notice given to the Settlement Class were in full compliance with the Court’s January 11, 2011 Order, the requirements of Fed. R. Civ. P. 23(e), and due process. The notice was adequate and reasonable, and constituted the best notice practicable under the circumstances. In addition, adequate notice of the proceedings and an opportunity to participate in the final fairness hearing were provided to the Settlement Class. The Court has reviewed the content of all of the various notices, as well as the manner in which Notice was disseminated, and concludes that the Notice given to the Class fully complied with Federal Rule of Civil Procedure 23, as it was the best notice practicable, satisfied all constitutional due process concerns, and provided the Court with jurisdiction over the absent Class Members. - Judge Robert M. Dow, Jr. Notices given to Settlement Class members and all other interested parties throughout this proceeding with respect to the certification of the Settlement Class, the proposed settlement, and all related procedures and hearings—including, without limitation, the notice to putative Settlement Class members and others more fully described in this Court’s order of 30th day of March 2011 were reasonably calculated under all the circumstances and have been sufficient, as to form, content, and manner of dissemination, to apprise interested parties and members of the Settlement Class of the pendency of the action, the certification of the Settlement Class, the Settlement Agreement and its contents, Settlement Class members’ right to be represented by private counsel, at their own cost, and Settlement Class members’ right to appear in Court to have their objections heard, and to afford Settlement Class members an opportunity to exclude themselves from the Settlement Class. Such notices complied with all requirements of the federal and state constitutions, including the due process clause, and applicable articles of the Louisiana Code of Civil Procedures, and constituted the best notice practicable under the circumstances and constituted due and sufficient notice to all potential members of the Settlement Class. Williams v. Hammerman & Gainer Inc. The form, content, and method of dissemination of Notice given to the Settlement Class were adequate and reasonable, and constituted the best notice practicable under the circumstances. The Notice, as given, provided valid, due, and sufficient notice of the proposed settlement, the terms and conditions set forth in the Settlement Agreement, and these proceedings to all persons entitled to such notice, and said notice fully satisfied the requirements of Rule 23 of the Federal Rules of Civil Procedure and due process. Mathena v. Webster Bank, N.A. Plaintiffs state that they have hired a firm specializing in designing and implementing large scale, unbiased, legal notification plans.69 Plaintiffs represent to the Court that such notice will include: 1) individual notice by electronic mail and/or first-class mail sent to all reasonably identifiable Class members; 2) nationwide paid media notice through a combination of print publications, including newspapers, consumer magazines, newspaper supplements and the Internet; 3) a neutral, Court-approved, informational press release; 4) a neutral, Court-approved Internet website; and 5) a toll-free telephone number. Similar mixed media plans have been approved by other district courts post class certification. The Court finds this plan is sufficient to meet the notice requirement. As previously set forth in this Memorandum Opinion, the elaborate notice program contained in the Settlement Agreement provides for notice through a variety of means, including direct mail to each class member, notice to the United States Attorney General and each State, a toll free number, and a website designed to provide information about the settlement and instructions on submitting claims. With a 99.9% effective rate, the Court finds that the notice program constituted the “best notice that is practicable under the circumstances,” Fed. R. Civ. P. 23(c)(2)(B), and clearly satisfies the requirements of Rule 23(c)(2)(B). Pavlov v. Continental Casualty Co. The Notice Plan, as implemented, satisfied the requirements of due process and was the best notice practicable under the circumstances. The Notice Plan was reasonably calculated, under the circumstances, to apprise Class Members of the pendency of the action, the terms of the Settlement, and their right to appear, object to or exclude themselves from the Settlement. Further, the notice was reasonable and constituted due, adequate and sufficient notice to all person entitled to receive notice. The Court finds that the manner and content of the notices for direct mailing and for publication notice, as specified in the Notice Plan (Exhibit 2 to the Affidavit of Lauran R. Schultz), provides the best practicable notice of judgment to members of the Plaintiff Class. The Court finds that the Notice Plan is the best notice practicable under the circumstances and provides the Eligible Members of the Settlement Class sufficient information to make informed and meaningful decisions regarding their options in this Litigation and the effect of the Settlement on their rights. The Notice Plan further satisfies the requirements of due process and 735 ILCS 5/2-803. That Notice Plan is approved and accepted. This Court further finds that the Notice of Settlement and Claim Form comply with 735 ILCS 5/2-803 and are appropriate as part of the Notice Plan and the Settlement, and thus they are hereby approved and adopted. This Court further finds that no other notice other than that identified in the Notice Plan is reasonably necessary in this Litigation. Dolen v. ABN AMRO Bank N.V. The Court finds that the dissemination of the Class Notice under the terms and in the format provided for in its Preliminary Approval Order constitutes the best notice practicable under the circumstances, is due and sufficient notice for all purposes to all persons entitled to such notice, and fully satisfies the requirements of the Federal Rules of Civil Procedure, the requirements of due process under the Constitution of the United States, and any other applicable law…Accordingly, all objections are hereby OVERRULED. In re Trans Union Corp. The form, content, and method of dissemination of the notice given to the Settlement Class were adequate and reasonable and constituted the best notice practicable in the circumstances. The notice as given provided valid, due, and sufficient notice of the proposed settlement, the terms and conditions of the Settlement Agreement, and these proceedings to all persons entitled to such notice, and the notice satisfied the requirements of Rule 23, Federal Rules of Civil Procedure, and due process. Lockwood v. Certegy Check Services, Inc. The form, content, and method of dissemination of notice provided to the Settlement Class were adequate and reasonable, and constituted the best notice practicable under the circumstances. The Notice, as given, provided valid, due, and sufficient notice of the proposed settlement, the terms and conditions set forth in the Settlement Agreement, and these proceedings to all Persons entitled to such notice, and said Notice fully satisfied the requirements of Fed. R. Civ. P. 23 and due process.